Wendy Gillissen (Delft, 1969) has always been fascinated by dreams and the supernatural. After graduating in Clinical Psychology, she specialized in dreamwork and past life therapy. She taught her first course in dreamwork in 1998. The urge to write and her love for the world of castles, elves and ghosts stem from the time she was five years old and her parents first took her to the ancient hills of England, Scotland and Wales. Inspired by a journey to the Greek island of Kefalonia in 2005, Wendy began writing 'Curse of the Tahiéra'. 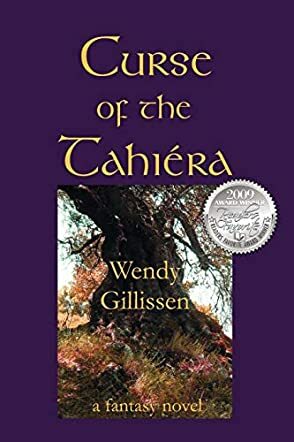 Initially, 'Curse of the Tahiéra' began life as a short story but when Yldich walked into the tale of his own accord, it became clear Wendy had something else on her hands altogether. For months, Rom and Yldich kept her busy with their adventures, springing scenes from the story on her at the oddest times, and soon it felt as if she was actually sharing her house with them. Although a little overwhelming, the process of writing proved amazingly inspiring. As Wendy was completing 'Curse of the Tahiéra' ideas for a sequel already came flooding in. Currently Wendy is writing part two, 'The Search for Tzanáta', of what will probably become a trilogy. In her spare time she plays the Celtic harp. Half Tzanatzi, Rom was not well accepted. He was a traveling merchant, peddling his dyes and spices. He traveled according to the seasons. This time he would travel through the Gardeth Forest, he'd been warned not to. People had been disappearing, later their bodies would be found frozen with an expression of terror on their face. He was not looking for companionship but the self proclaimed farmer Yldich seemed determined to travel with him. Rom doubted he was actually a farmer. Yldich had a special way of communicating with animals. He seemed to have mystical powers. Wendy Gillissen offers readers a fantasy that will stay with them long after they read the last page. This is a book you will want to read more than once. Each time you will pick up on something you over looked the first time. Curse of the Tahiéra quickly drew me into the tale. I found myself in a mythical land traveling with Rom, Yldich and Eald. Gillissen has created a world of her own imagination. The plot is deep yet entertaining. Dreams and reality mix in the world Gillissen has created. Rom and Yldich are on a journey; along the way they make many stops and at each stop the reader is provided a bit more of the story. Dreams, mystical stories, magic and good versus evil, this book provide it all and much, much more. "The limitations you put on the world are stronger than its inherent magic." really got to read it soon!